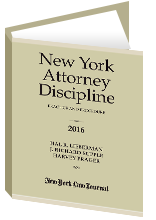 Reprinted with permission from the August 22, 2013 edition of the New York Law Journal ©2013 ALM Media Properties, LLC. All rights reserved. Further duplication without permission is prohibited. For information, contact 877-257-3382 – reprints@alm.com or visit www.almreprints.com.